are they available to others that didn't make your trip? Or how can we try to get one? How beautiful the rosary is as well as what it represents. STEVE RAY HERE: sorry but we don’t sell these or provide them to the public. We get them for our pilgrims come with us to the holy land. Great testimony! Pray the one that I have will help fix a problem I have had for a while. 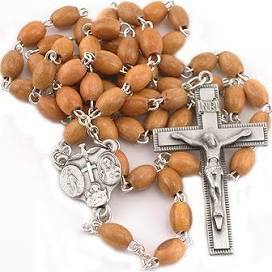 Where can I get this rosary? STEVE RAY HERE: sorry, but we don’t sell these. We get them for pilgrims when we go to the holy land. I have a Rosary for you from my trip this last month. It was my fourth trip with Steve and Janet and I love to share. Send my you mailing address via my email, tgovern@comcast.net. I can share two or three but need the others I brought back for friends at Church. Previous post: Where Does the Bible Say We Should Pray to Dead Saints? Next post: Power of the Rosaries from the Holy Land! !